Smash Hits was a pop magazine in the UK from the late 70s into the 2000s. This article with Eric B. 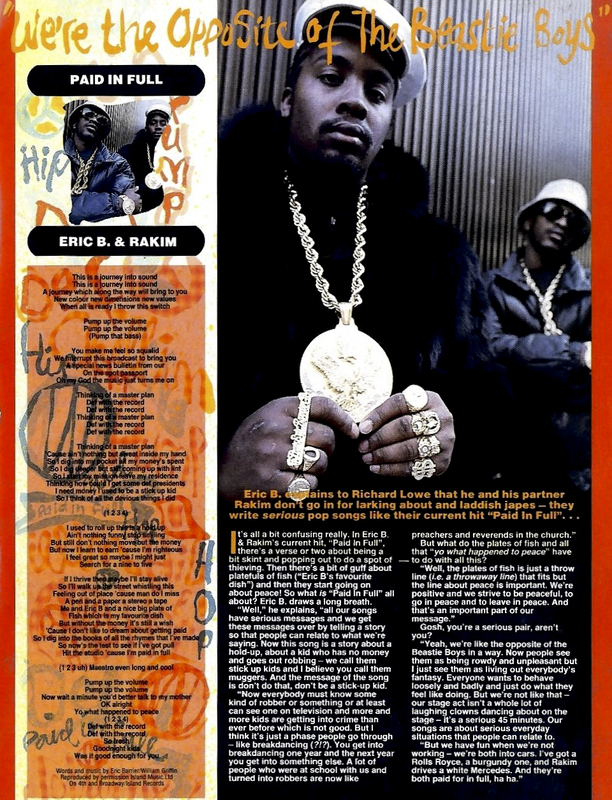 & Rakim was featured in their November-December issue in 1987. In the brief interview, Eric B made reference to them being the opposite of the Beastie Boys & while it wasn't the focus of the article, headlines do sell, lol. "Yeah, we're like the opposite of the Beastie Boys in a way," Eric B says in response to being 'a serious pair.' "Now people see them as being rowdy and unpleasant but I just see them as living out everybody's fantasy. Everyone wants to behave loosely and badly and just do what they feel like doing. But we're not like that -- our stage act isn't a whole lot of laughing clowns dancing about on the stage -- it's a serious 45 minutes. Our songs are about serious everyday situations that people can relate to." The article, promoting their 'Paid In Full' release, also includes the lyrics and a breakdown of some of the bars about positivity & their ultimate message on the song, 'don't be a stick up kid!' Sound advice, lol.